h = waldtest(r,R,EstCov) returns a logical value (h) with the rejection decision from conducting a Wald test of model specification. waldtest constructs the test statistic using the restriction function and its Jacobian, and the value of the unrestricted model covariance estimator, all evaluated at the unrestricted parameter estimates (r, R, and EstCov, respectively). If any input argument is a cell vector of length k > 1, then the other input arguments must be cell arrays of length k. waldtest(r,R,EstCov) treats each cell as a separate, independent test, and returns a vector of rejection decisions. If any input argument is a row vector, then the software returns output arguments as row vectors. h = waldtest(r,R,EstCov,alpha) returns the rejection decision of the Wald test conducted at significance level alpha. [h,pValue] = waldtest(___) returns the rejection decision and p-value (pValue) for the hypothesis test, using any of the input arguments in the previous syntaxes. [h,pValue,stat,cValue] = waldtest(___) additionally returns the test statistic (stat) and critical value (cValue) for the hypothesis test. Check for significant lag effects in a time series regression model. 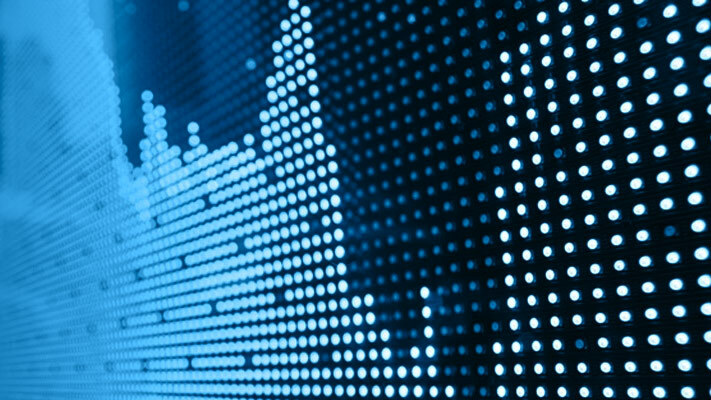 Load the U.S. GDP data set. 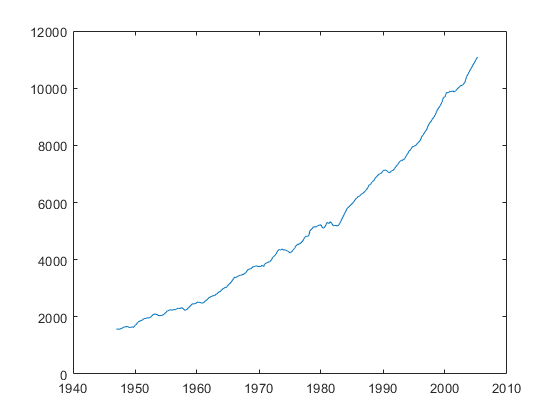 Plot the GDP against time. The series seems to increase exponentially. Transform the data using the natural logarithm. Estimated, unrestricted parameter covariance matrix. Estimate the coefficients of the unrestricted model. UMdl is a fitted LinearModel model. It contains, among other things, the fitted coefficients of the unrestricted model. Specify r, R, and the estimated, unrestricted parameter covariance matrix. Test for a significant lag 2 effect using the Wald test. h = 1 indicates that the null, restricted hypothesis (β2=0) should be rejected in favor of the alternative, unrestricted hypothesis. pValue is quite small, which suggests that there is strong evidence for this result. Test whether there are significant ARCH effects in a simulated response series using waldtest. wt is Gaussian with mean 0 and variance 1. Specify the model for the simulated data. Mdl is a fully specified AR(1) model with an ARCH(1) variance. Simulate presample and effective sample responses from Mdl. epsilon is the random path of innovations from VarMdl. The software filters epsilon through Mdl to yield the random response path y.
where ht=α0+α1εt-12. Fit the simulated data (y) to the unrestricted model using the presample observations. UEstMdl is the fitted, unrestricted model, and UEstParamCov is the estimated parameter covariance of the unrestricted model parameters. The restriction function evaluated at the unrestricted parameter estimates is r=αˆ1. The Jacobian of r evaluated at the unrestricted model parameters is R=. The unrestricted model estimated parameter covariance matrix is UEstParamCov. Test the null hypothesis that α1=0 at the 1% significance level using waldtest. h = 0 indicates that the null, restricted model should not be rejected in favor of the alternative, unrestricted model. This result is consistent with the model for the simulated data. Specify the true ARMA(2,1) model, and simulate 100 response values. Specify the unrestricted model and the names of the candidate models for testing down. UMdl is the unrestricted, ARMA(2,2) model. RMdlNames is a cell array of strings containing the names of the restricted models. Fit the unrestricted model to the simulated data. UEstMdl is the fitted, unrestricted model, and UEstParamCov is the estimated parameter covariance matrix. The unrestricted model has six parameters. To construct the restriction function and its Jacobian, you must know the order of the parameters in UEstParamCov. For this arima model, the order is [c,ϕ1,ϕ2,θ1θ2,σ2]. Each candidate model corresponds to a restriction function. Put the restriction function vectors into separate cells of a cell vector. r is a 7-by-1 cell vector of vectors corresponding to the restriction function for the candidate models. Put the Jacobian of each restriction function into separate, corresponding cells of a cell vector. The order of the elements in the Jacobian must correspond to the order of the elements in UEstParamCov. Put the estimated parameter covariance matrix in each cell of a 7-by-1 cell vector. Apply the Wald test at a 1% significance level to find the appropriate, restricted model specifications. RestrictedModels lists the most appropriate restricted models. You can test down again, but use ARMA(2,1) as the unrestricted model. In this case, you must remove MA(2) from the possible restricted models. Test whether the parameters of a nested model have a nonlinear relationship. 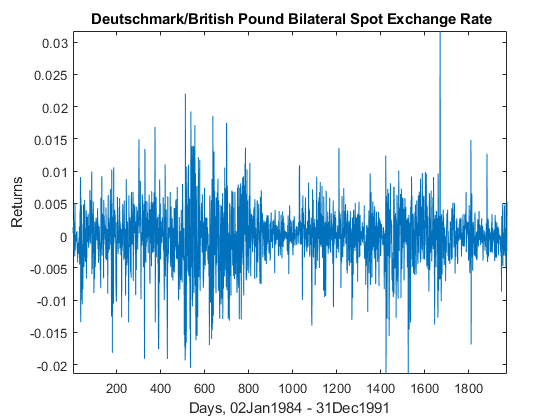 Load the Deutschmark/British Pound bilateral spot exchange rate data set. The data set (Data) contains a time series of prices. Convert the prices to returns, and plot the return series. The returns series shows signs of heteroscedasticity. Suppose that a GARCH(1,1) model is an appropriate model for the data. Fit a GARCH(1,1) model to the data including a constant. g1 is the estimated GARCH effect, and a1 is the estimated ARCH effect. where γ1 is the GARCH effect and α1 is the ARCH effect. Specify these relationships as the restriction function r(θ)=0, evaluated at the unrestricted model parameter estimates. This specification defines a nested, restricted model. Specify the Jacobian of the restriction function vector. Conduct a Wald test to assess whether there is sufficient evidence to reject the restricted model. h = 1 indicates that there is sufficient evidence to reject the restricted model in favor of the unrestricted model. pValue = 0 indicates that the evidence for rejecting the restricted model is strong. Restriction functions corresponding to restricted models, specified as a scalar, vector, or cell vector of scalars or vectors. If r is a q-vector or a singleton cell array containing a q-vector, then the software conducts one Wald test. q must be less than the number of unrestricted model parameters. If r is a cell vector of length k > 1, and cell j contains a qj-vector, j = 1,...,k, then the software conducts k independent Wald tests. Each qj must be less than the number of unrestricted model parameters. Restriction function Jacobians, specified as a row vector, matrix, or cell vector of row vectors or matrices. If R is a q-by-p matrix or a singleton cell array containing a q-by-p matrix, then the software conducts one Wald test. q must be less than p, which is the number of unrestricted model parameters. If R is a cell vector of length k > 1, and cell j contains a qj-by-pj matrix, j = 1,...,k, then the software conducts k independent Wald tests. Each qj must be less than pj, which is the number of unrestricted parameters in model j. Unrestricted model parameter covariance estimates, specified as a matrix or cell vector of matrices. If EstCov is a p-by-p matrix or a singleton cell array containing a p-by-p matrix, then the software conducts one Wald test. p is the number of unrestricted model parameters. If EstCov is a cell vector of length k > 1, and cell j contains a pj-by-pj matrix, j = 1,...,k, then the software conducts k independent Wald tests. Each pj is the number of unrestricted parameters in model j.
Nominal significance levels for the hypothesis tests, specified as a scalar or vector. Each element of alpha must be greater than 0 and less than 1. If alpha is a scalar, then the software expands it to a k-by-1 vector. If alpha is a vector, then it must have length k.
Test rejection decisions, returned as a logical value or vector of logical values with a length equal to the number of tests that the software conducts. h = 1 indicates rejection of the null, restricted model in favor of the alternative, unrestricted model. h = 0 indicates failure to reject the null, restricted model. Test statistic p-values, returned as a scalar or vector with a length equal to the number of tests that the software conducts. Test statistics, returned as a scalar or vector with a length equal to the number of tests that the software conducts. Critical values determined by alpha, returned as a scalar or vector with a length equal to the number of tests that the software conducts. The Wald test compares specifications of nested models by assessing the significance of q parameter restrictions to an extended model with p unrestricted parameters. r is the restriction function that specifies restrictions of the form r(θ) = 0 on parameters θ in the unrestricted model, evaluated at the unrestricted model parameter estimates. In other words, r maps the p-dimensional parameter space to the q-dimensional restriction space. In practice, r is a q-by-1 vector, where q < p.
Usually, r=θ^−θ0, where θ^ is the unrestricted model parameter estimates for the restricted parameters and θ0 holds the values of the restricted model parameters under the null hypothesis. R is the restriction function Jacobian evaluated at the unrestricted model parameter estimates. Σ^θ^ is the unrestricted model parameter covariance estimator evaluated at the unrestricted model parameter estimates. W has an asymptotic chi-square distribution with q degrees of freedom. When W exceeds a critical value in its asymptotic distribution, the test rejects the null, restricted hypothesis in favor of the alternative, unrestricted hypothesis. The nominal significance level (α) determines the critical value. Wald tests depend on the algebraic form of the restrictions. For example, you can express the restriction ab = 1 as a – 1/b = 0, or b – 1/a = 0, or ab – 1 = 0. Each formulation leads to different test statistics. Estimate unrestricted univariate linear time series models, such as arima or garch, or time series regression models (regARIMA) using estimate. Estimate unrestricted multivariate linear time series models, such as varm or vecm, using estimate. estimate returns parameter estimates and their covariance estimates, which you can process and use as inputs to waldtest. lratiotest requires both restricted and unrestricted parameter estimates. lmtest requires restricted parameter estimates. waldtest performs multiple, independent tests when the restriction function vector, its Jacobian, and the unrestricted model parameter covariance matrix (r, R, and EstCov, respectively) are equal-length cell vectors. If EstCov is the same for all tests, but r varies, then waldtest “tests down” against multiple restricted models. If EstCov varies among tests, but r does not, then waldtest “tests up” against multiple unrestricted models. Otherwise, waldtest compares model specifications pair-wise. alpha is nominal in that it specifies a rejection probability in the asymptotic distribution. The actual rejection probability is generally greater than the nominal significance. The Wald test rejection error is generally greater than the likelihood ratio and Lagrange multiplier test rejection errors. Davidson, R. and J. G. MacKinnon. Econometric Theory and Methods. Oxford, UK: Oxford University Press, 2004. Godfrey, L. G. Misspecification Tests in Econometrics. Cambridge, UK: Cambridge University Press, 1997. Greene, W. H. Econometric Analysis. 6th ed. Upper Saddle River, NJ: Pearson Prentice Hall, 2008.